This outstanding residential property is located in the gated community of “Las Nubes”, a fine residential complex located in Playa Jacó. 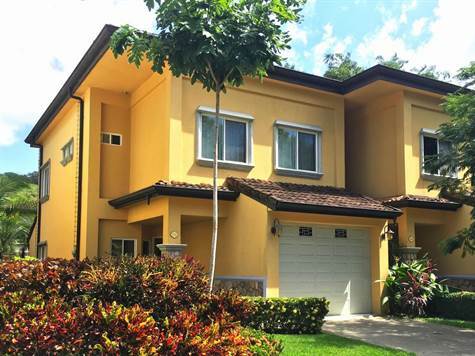 This 2 level townhouse is a very spacious with 2000 sq. ft.
Downstairs is the open concept living & dining area with gourmet kitchen. The kitchen features fine wooden cabinetry, top of the line stainless steel appliances, plus granite counter-tops. This kitchen is a “Cooks Delight” with ample storage space for all your kitchen accessories, extensive counter space plus eat on breakfast bar. This upscale home features 3 bedrooms with 2.5 baths. The master suite is very spacious with en suite master bath and lots of closet space. The open concept living /dining area opens to a covered terrace for BBQ and dining outside. The topically landscaped yard and garden is very private and ideal for relaxing and enjoying the breezes. Additional amenities include: 1 car garage + 1 additional parking space and Laundry room. The community is composed of 43 houses. Common areas include pool, gym, BBQ area, guard house and 24-hour security. Nearby Attractions: Less than ten minutes from this property you will find Los Sueños Resort and Marina, Iguanas 18 hole Golf Course, supermarkets: Auto Mercado, several Canopy tours, surfing spots in Playa Jacó and Playa Hermosa, variety of gourmet restaurants, as well as good nightlife venues in Jacó Downtown. All utilities underground, High Speed Internet. High tech sewerage treatment plant.